Trail etiquette is basically a matter of minimizing our impact on the environment, with special considerations for disturbing wildlife, vegetation, soil, water, and pollution. Of course, trail etiquette also includes aesthetic impacts that we have on other users in the mountains. Garbage left at trailhead in our national parks. • Maintain a minimum distance of 30 m (100 ft) for most wildlife, and 100 m (300 ft) for bears. • Respect trail closures and travel restrictions relating to wildlife movement. • Follow park rules and regulations and never approach or feed wildlife. • Enjoy any wildlife you see from a distance, never “chase” the animal hoping to capture that perfect photograph. • Use binoculars and telephoto lenses to reduce the urge to get close. • Ensure that you and your group stay on designated trails and use designated resting and stopping areas. • If you must travel off-trail in the alpine, spread out the group so as to not develop a path (it’s surprising how little it takes to make a trail in the alpine). • Use good footwear and gaiters to avoid the temptation to trail braid or travel off-trail to avoid wet or muddy areas. • Keep to designated trails and use bridges where provided. 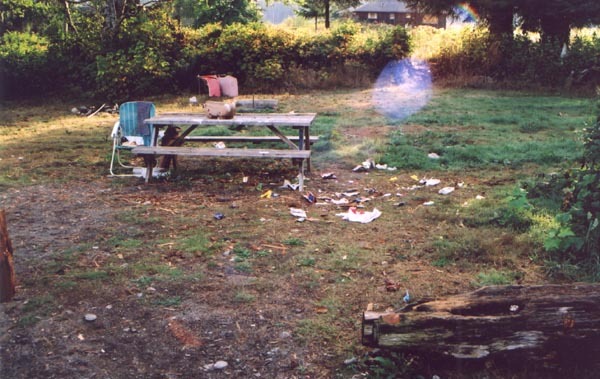 • Use trailhead outhouse/washroom facilities before beginning the hike. • Never urinate closer than 50 m (150 ft) to a water source or drainage system. • Make a cat hole (a hole dug 15 cm or 6″ into the ground) no closer than 50 m (150 ft) from a water source and bury human waste. Burn or carry-out used toilet paper. Do not bury toilet paper as it takes a long time to break down when buried. • Never wash or bathe in a mountain creek or stream. Instead, collect water and wash no closer than 50 m (150 ft) from the water source. Dispose of grey water in the same manner. Use biodegradable soaps. • Pack out all garbage and help where possible by picking up garbage left by others. • Avoid garbage by removing excess packaging prior to the hike, and use reusable lunch bags. People travel into the outdoors and mountains for various reasons, but many want to escape the hectic pace of the city or are in search of solitude. Please be considerate of the other users, and keep excess noise to a minimum. It is polite to allow faster groups to pass, or to step off the trail for hikers with heavier loads to pass from the other direction. Simply, be considerate. I generally do not offer friendly advice to others on the trail unless they appear to need help or ask for it. I stood in the parking lot of Mount Robson with my friend Tom as we prepared our climbing gear when a stranger approached, asked if we were climbing Robson, and offered this advice in a stern warning, “I’ve never climbed before, but I hear its tough, and you should be careful.” Ok… thanks. My personal pet peeves are: “You’re almost there”, “Where’s the snow?” (referring to trekking poles), and “Only 15 more minutes”. I’m not suggesting not to strike up a friendly conversation, but a group that is moving very slowly may take 45 minutes to cover the “only 15 more minutes”, and that can wreak havoc on their motivation levels. If asked, I give something more tangible such as, “It’s only 1 more kilometre”.